The Unimetro UTMM series video tool industrial microscopes are a photoelectric measuring system of high precision and efficiency. it is widely used in precision industries, such as electronics, molding, plastic, tools, rubber and PCB processing etc. The Unimetro UTMM series video tool industrial microscopes are applied in 2D and 3D measurement. 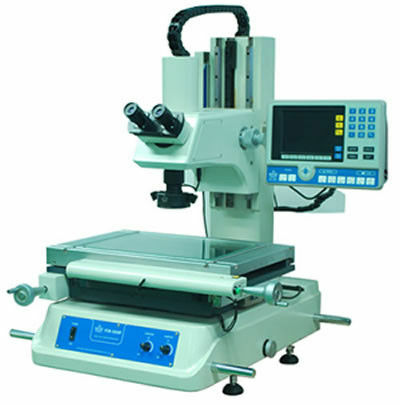 With eyepiece gauge , This tool microscope is also able to measure by comparing . TThe Unimetro UTMM series is also available for measuring the pitch and external diameter of the thread . The Unimetro UTMM series video tool industrial microscopes are powerful measuring instruments for the QC department, laboratory or workshop of various sectors concerning to machinery ,electronics, gauging instrument as well as academies, research institutions and measurement-inspecting department. The Unimetro UTMM series video tool industrial microscopes have many functions such as displaying, magnifying, inputting and outputting. With color CCD camera (with C-mount interface), the microscope can input and output the data by connecting with the PC. The Unimetro UTMM series is very convenient for the user to measure with standard Sunnyoo 2D or QIM 3008 software.